This is a plastic craft pumpkin I bought at Michaels…it comes in black, white, orange and I think I saw some in pink. I really had a lot of fun doing this black pumpkin with white Gelly Roll pen….and you can see my new tangle, Podzles there on the right side. I have one more I’m working on in a orangy, metalic pen and I’m close to finishing that – it will be done this weekend. In sheepy news – I’ve three more sketches to ink in and so many more to do…..I was hoping to put together a calender for the holidays, but I’m also getting ready for a Juried Art show in December…..so much to do, not enough time! 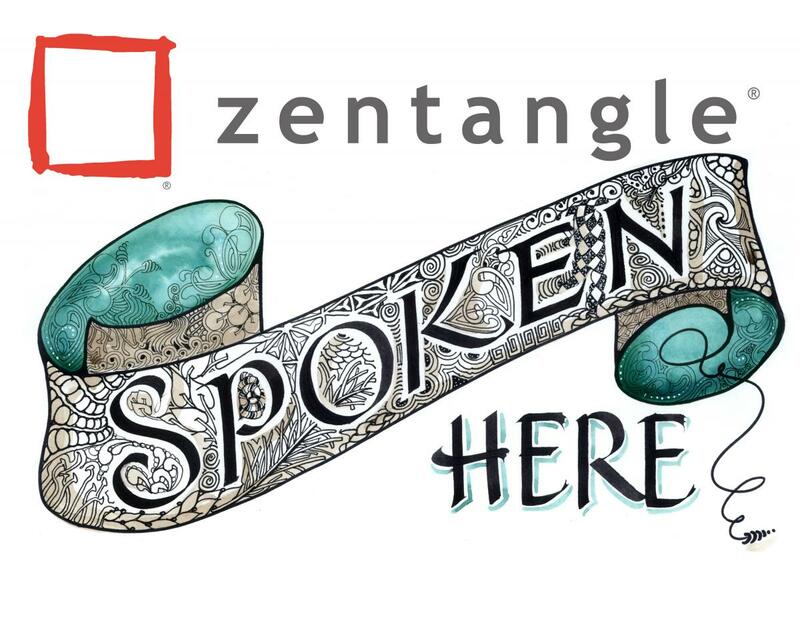 Finally, I’ve mentioned it before, but if you haven’t seen it, there is a Great little group on Facebook called For the Love of Doodling – we love doodles, zentangle, zia and it has grown to over 600 members in under two months! We try to keep it interesting, so come on over and join us…I promise you will be inspired and motivated and you won’t be disappointed! Fibernut, Metal/Jewelry Artisan, Mom, Wife, Para, You Name It! Happy October! Was browsing through my favorite blogs this morning and was really inspired by this holiday project. 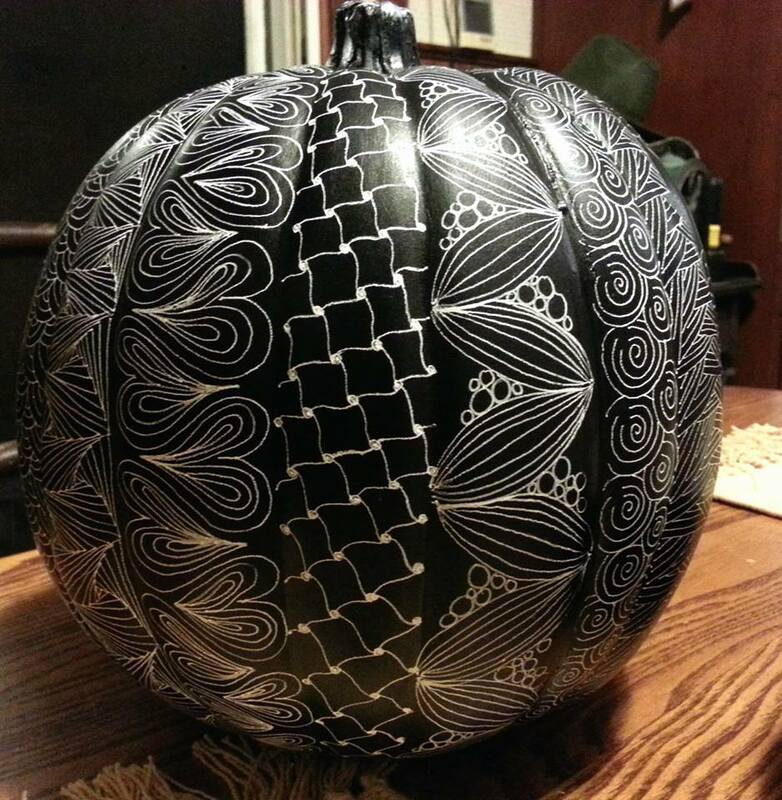 A Zentangler, which is a type of doodling, decided to doodle all over a plastic black pumpkin. I think I’m going to have to try this. Maybe my doodles need to go beyond the napkin and onto something three dimensional. Oh, the possibilities! So yeah, check out this site. The Adventures of a Dropstitcher’s blog is a lovely site that has plenty of ideas to inspire. I love this craft and your ideas so much that I decided to reblog it on my blog. Thanks for the great Halloween idea! Thanks! I’m glad you liked it that much! This is really pretty. Do you have to wait for the ink to dry and does it have any kind of finish on it? Can’t wait to see the orange ink one. Thank you. I used Sakura Gelly Roll pen on it, and yes you have to wait for the ink to dry – You just need to be careful you don’t smear the section you just finished while you’re working on another. I will be spraying these with a clear coat of finish to protect them. That is stunning!!!! I love it!! Love, love, love!!! I must go to Michaels now. My eyes have been opened. I’ve never thought to doodle on anything other than paper. I was thinking of applying some fall leaves to a plastic pumpkin with modpodge, but this beats that. Thank you! I doodle on EVERYTHING, LOL!